With so many titles in so many genres available, selecting your next good read can feel overwhelming. Adding to the pressure is the chance that the book you pick out will disappoint you. Even if you have stacks upon stacks of books that you haven’t read on every surface of your home, none of those may seem right. We understand how difficult this decision can be. The Bookmans team is always prepared with recommendations to guide you to your next favorite book. From mysteries to biographies, just ask because we’ve got you covered. If fiction is your addiction Pat, the Visual Merchandiser and book buyer for Bookmans Flagstaff swears by these two novels. Mae Holland, a young twenty-something, can’t believe her good fortune when she’s is hired by one of the country’s top internet companies, The Circle. This fictional google-esk company encourages creativity by providing a campus-type work environment. Catering to their employees’ needs with state-of-the-art dorms, first-class food services, all night parties and concerts with famous musicians, it’s a dream come true for Mae. Mae works hard and becomes a dedicated employee of The circle and its mission of providing a universal operating system that links a person’s personal email, social media and their on-line shopping and banking accounts. We read as Mae’s dedication and work ethic are taken advantage of and The Circle insidiously takes control of her life. The surprise ending prevents this novel from becoming your run-of-the-mill cautionary tale. Providing a thought-provoking examination of the relationship between the newest technological advances and our own right to privacy, this story is Google meets Reality T.V. meets 1984. I recently discovered Dara Horn and I am impressed. Horn graduated from Harvard University with a Ph.D. in comparative literature focusing on Hebrew and Yiddish studies. Her second novel The World to Come begins with the theft of a million dollar Chagall painting from a museum. The thief, Benjamin Ziskind, recognizes the painting as being one that belonged to his family and was lost due to an act of deception. Benjamin decides spur of the moment to “reclaim” the painting. Weaving a beautiful narrative of family history, religion and art, Horn uses true events, places and historical figures such as artist Marc Chagall and many Yiddish writers to solidify her story. I am halfway through her first novel In the Image and enjoying it greatly. Dara Horn is an amazing story teller. 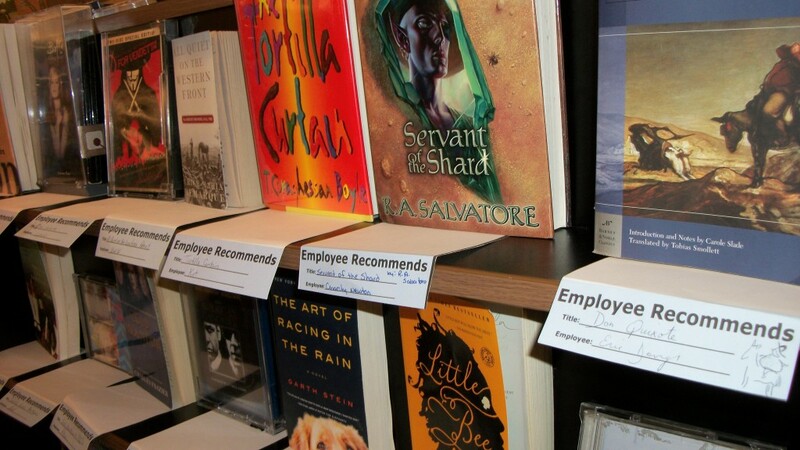 Check out our employee recommends shelf to see what we are reading.